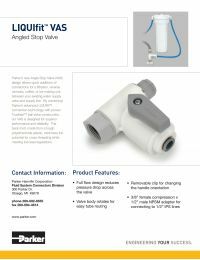 The Parker LIQUIfit angle stop adapter valve is designed to allow the quick addition of connections for a filtration, reverse osmosis, coffee or ice maker system between your existing water supply valve and supply line. By combining Parker's LIQUIfit connection technology with proven TrueSeal ball valve construction, the LFPP6VAS8 is designed for superior performance and reliability. Good choice if you are unsure which size angle stop you have. LFPP6VAS8 2.02" 1.31" 2.40" 1.11" 1.41" .91"